Are your middle-schoolers looking for something fun & different to do this fall? 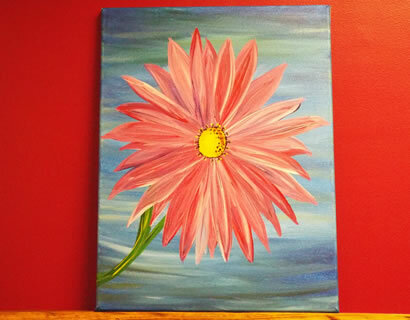 Wet Paint in Raymond NH has announced their after-school painting program. They will be offering two separate six week sessions. Each session costs just $60, they will spend one hour a week 3:30 to 4:30 for six weeks with our talented artists to create their own masterpieces, every child goes home with two finished paintings. After attending paint nights with their friends the past couple years, two busy moms, Leslie Arnold and Corrie Cantwell, both from Nottingham, decided they wanted to start their own business offering paint nights. 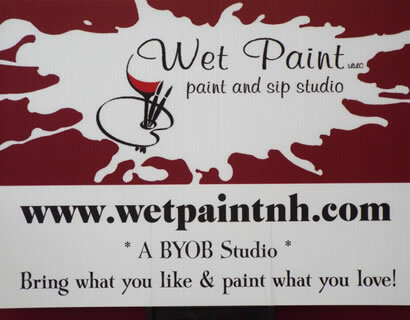 Wet Paint is a Bring Your Own Beverage paint studio where you “Bring what you like and paint what you love”. Their slogan says it all. You can bring your own alcoholic beverage to sip while painting or purchase non-alcoholic drinks of water, soda or iced tea along with a variety of light snacks. Arnold and Cantwell looked for a place to open their business in Epping, Northwood and Lee as well as a couple different sites in Raymond before they found the perfect location in the Cozy Corner Plaza at the intersection of routes 27 and 156. 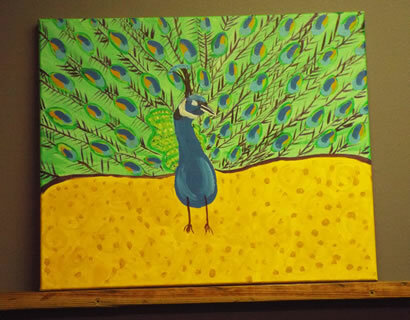 Displayed on the walls are all the various paintings that guests can select from to paint for themselves. Each painting is led by a local artist during a 2 hour guided class. No previous painting experience is necessary. All materials are provided for you, including the canvas, acrylic paints, brushes, easels, aprons, blow dryer to dry the art work and most importantly the fun and enjoyable atmosphere. 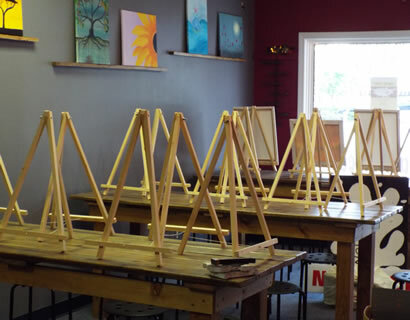 The studio can seat up to 42 guests with 7 people at each table while the artist walks around and coaches you through the color selections and strokes on the canvas. Arnold and Cantwell opened Wet Paint to the first group of ladies looking for fun, laughter, arts and crafts on August 21st. Sessions are available from 7 pm to 9 pm Fridays and Saturdays and from 1 pm to 3 pm on Sundays. It is required that guests arrive a half hour early for welcoming socialization, setup and seating. Arnold said they plan to offer additional programs including after school sessions, sketching, cartooning and possibly pin-striping once they get the initial schedule underway. Cantwell said they will also accommodate Guys & Girls night out, Date night, Birthday parties, Bachelor & Bachelorette parties, Family events, Anniversaries, Private parties, Team/Business outings, other specialized workshops and more. To check out all the painting selections and book your session visit the Wet Paint website. 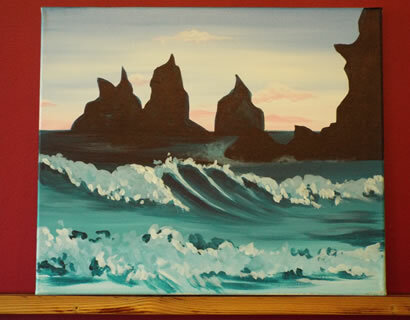 Reserve your seat by paying $35 online for the picture that you want to paint and hang in your home. Contact Leslie Arnold or Corrie Cantwell by email at wetpaintnh@yahoo.com or call 603-793-5590. Wet Paint is located at 61 Rte 27 suite #3 in Raymond, NH.